I can't recall the exact time we met as young stews, but Marcie and I became good friends in a short time. Her relaxed southern California manner, long chestnut hair and turquoise jewelry seemed so different from my Ohio roots. She was a Sandra Bullock lookalike, before Sandra Bullock. Not taking a lot seriously, she laughed often. 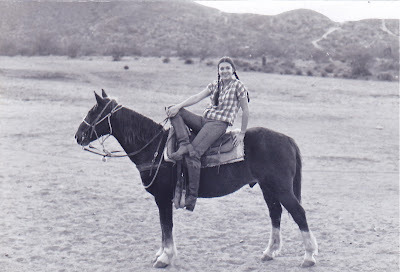 She grew up riding horses year round in the warm California sun. Animals felt comfortable beside her and she beside them. She actually felt comfortable everywhere. We became roommates along with a few other friends in a carriage house on an Old Westbury estate on New York's Long Island. Pam, The Gypsy Chef was one of them, but that is a whole other story. Somewhere around the time we decided to load up our VW Bugs to move to San Fransisco, Marcie invited me to go to the Academy Awards and the Governor's Ball that year. Her charming stepfather, Jerry, an exec for Disney, was in charge of security for the ceremony and every year received tickets. Let's see...lemme think...OK, I'll go (in a New York minute!) We flew out to L.A. from New York and I met her mom and stepfather for the first time. Her mom was slim and stylish in her capri pants. 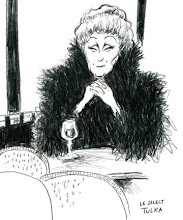 As we sat and chatted, she balanced a cigarette in one hand and a martini in the other, and her somewhat husky voice was warm and inviting. She was California casual chic, with full command of life. Their ranch style home was informal, but very pulled together, just like Marilyn. Oh yeah, I even liked her name. Over her delicious dinner, her motherly wisdom realized I needed a new dress to wear to this Hollywood bash. So she loaned me one. Cinderella had nothing on me! The evening came, the red carpet rolled out and the stars arrived. I remember having a captivating conversation with the beautiful Estee Lauder as she came in with the other guests. At one point we were backstage as the winner's exited the stage after receiving their award. We saw Oscar from a whole new viewpoint. Steve Martin was a presenter then, during his "arrow through the head" days, and this year he is a co-host. (Click on the photo to enlarge the program.) The Governor's Ball afterward was a glorious blur for this 20 something. I was so glad I had Marilyn's loaner on...my Ohio dud's just wouldn' t have been right! Marcie was used to all of this, I guess that was why she was so comfortable everywhere. Picture taking was tightly controlled, so I have no pics. Marcie is looking through her photos, so hopefully I'll be able to add a few later. The next day we had a chance to have our photos taken with the large Oscar, but my dratted camera jammed....where were iphones when you needed them?! Even the studio camera men couldn't get it to unjam. I have the pictures in my mind, but the years have caused them to fade a little around the edges, just like my souvenir program. 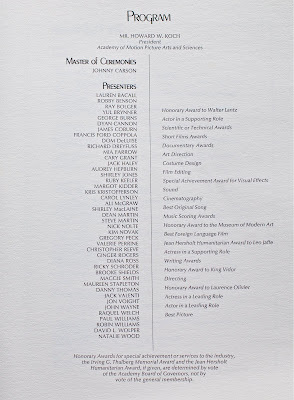 Marcie's son is very involved in acting now, so you never know if we'll be revisiting the Awards Ceremony in the future, sans the loaner dress and with a martini in my hand. Marilyn this martini is for you. Thanks for the memories. 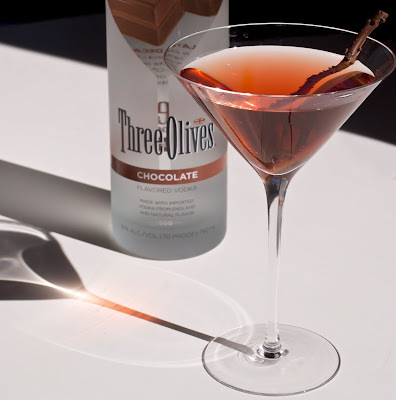 Pour the chocolate vodka in 8 ounce chilled martini glasses, or mix desired servings in a pitcher. 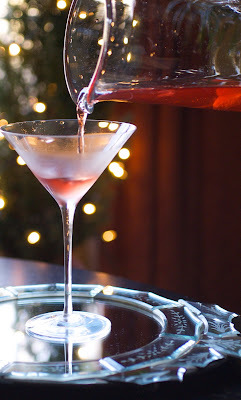 Add a splash or 2 of chilled cherry juice, more or less according to taste. Put in a chocolate stick as a stirrer. I used Mademoiselle de Margaux Chocolate twigs. Serve immediately. 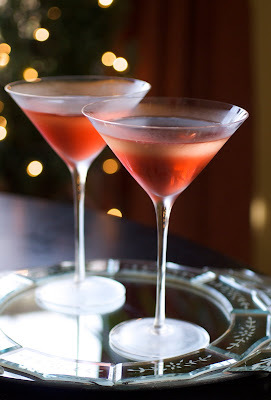 Red Carpet Chocolate Cherry Martini recipe click here. How NEAT! And that you kept all that..even neater. Your cocktail shots are GREAT too.. and that hideaway.. I would love to know more.. 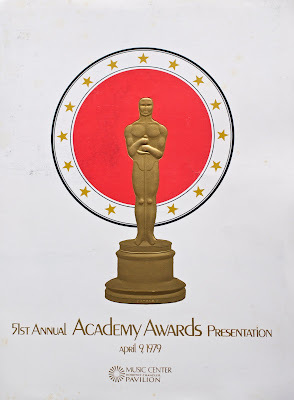 I have watched the Academy Awards since I can remember! The only thing I don't like now..is how old they make me feel w/ many having been tucked into their 20 yr old faces..
wow how lucky u are/were!!! I can just imagine u amoung the crowd...and I can imagine the crowd! how lovely that u kept the programme...that is quite a memory! What a FABULOUS post! 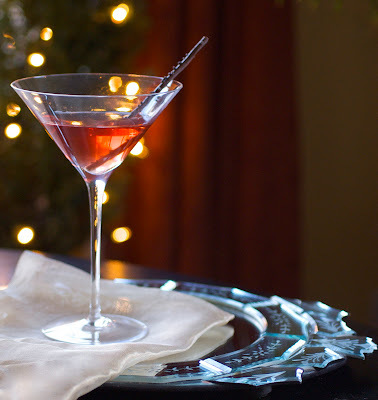 I think I need one of those martinis tonight! 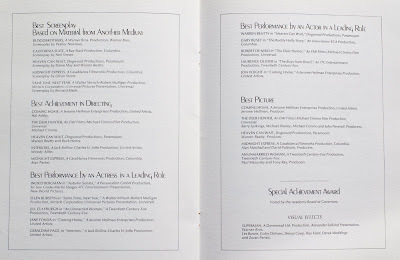 ...& you saved all the oscar printed pieces...how fabulous...& how great to have been part of that privileged night...wow! red carpet martini toast to you diane! 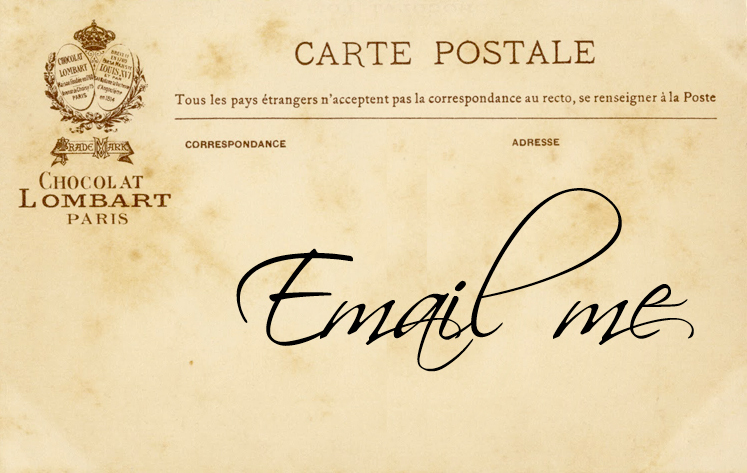 enjoy the evening & thanks for your wonderful posts! 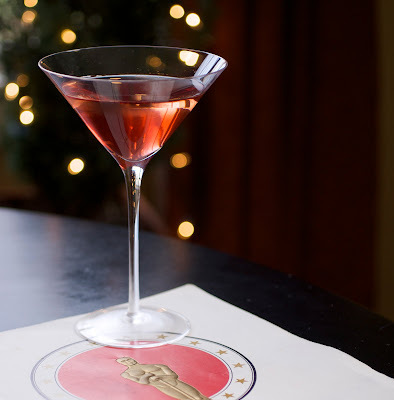 That martini is simple and elegant, like the best dresses at the Oscars. What a fun memory to have! A friend of mine has been a seat filler for years and has such good stories too. Oh how fantastic!! Steve Martin is the presenter today too ... am watching the Oscars as I type. LOL! I love how you presented (pun intended) your post. The martini look stunning!!! I kept the program in my file cabinet, so it has made all my travels well. I hadn't looked at it in a long time and was also surprised at all of the celebrities who are no longer with us. The looks between Alec Baldwin and George Clooney had the tweets all a twitter last night! I still haven't figured out what that was all about. Monique..."many having been tucked into their 20 yr old faces.." I love that description. When did growing old gracefully go out of fashion? Our little hideaway was a really fun time of life for all of us with such great memories. The estate was amazing. 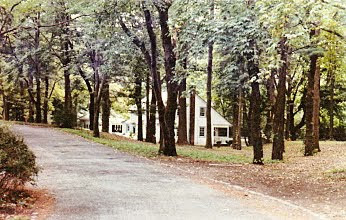 I'd love to go back sometime and see if the carriage house is still there. Karen..."That martini is simple and elegant, like the best dresses at the Oscars." It was so fun to photograph. It was like a fashion model in stilettos. And how about that simple and elegant dress that Sandra Bullock wore? Just stunning! Linda...I heard about the standoff between the cable company and ABC. You'd think they could settle it without the customer being in the middle. That's nice you had a friend to share the evening with. Dang, those martinis are good. A friend and I had a dress rehearsal the night before. Whew! I fell asleep.Darn..I only saw 1 hr.. But What was that re George Clooney? I wish he would have smiled. What gorgeous photos! I didn't see any of the Oscars. But then I hadnt' seen any of the films either, so I wouldn't have known what they were talking about. Dan's cousin used to work in Hollywood. He had two Oscars for technical inventions. He always had invitations to the Oscars, but I don't think he ever went. What I loved about going to his house was that he always had 'preview' copies of all the films. Sigh. Oh, and it was fun to see his Oscars too, gathering dust in his office. I LOVE these photos. How elegant. I love your description of the martini as wearing stiletto heels. Perfect! My favorite photo is the last one, with that little blast of color in the shadow of the stem. And the light coming through the bowl. A MAY ZING. What a wonderful post this is. I feel as if I know your friend. I hope she reads this. I remember this trip, the carriage house and all the fun we had. Marcie is all the things you said and more. Aren't we lucky to have her as a friend? Jerry and Marilyn have the gift of hospitality. Their door is always open and they make everyone welcome. Of course she supplied you with a dress! Lovely post Di, Thanks for the memories. Awesome! Lucky you. What great memories. When I have forgotten my camera, my daughter points to her head to remind my that's where fabulous memories are held. You never forget. 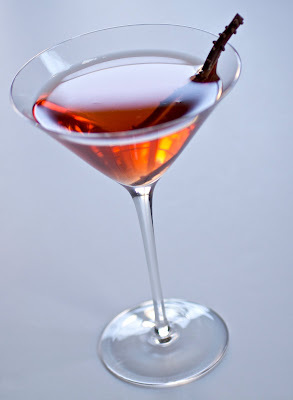 And a tip of the hat to Marilyn, for the martini in her honor! I missed this when my computer was on vacation.. what a great story... and that drink... beautiful photo... really star quality! So glad food with style let me catch it!! !